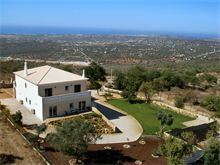 Casa dos Sonhos enjoys an unrivalled elevated position with breathtaking views of the Algarve coast line. Just a few minutes drive inland from Vilamoura, this popular resort, and the entire Atlantic Ocean form the backdrop of the view from the main pool terrace and the balconies from the upstairs front bedrooms. 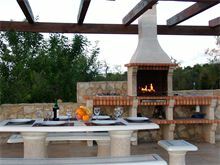 If this view is not stunning enough then to the west is the Monchique Mountains, where spectacular fiery red sunsets can be enjoyed from the superb barbecue terrace complete with brick built bbq, gas hob and sink, providing an idyllic setting for al-fresco summer meals. The owners carefully designed and built this property to their own exacting standards and this traditionally styled spacious villa with thoroughly modern features now stands in place of the original old farm house. 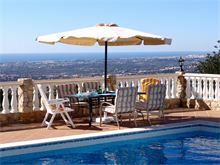 The generous sized pool is solar heated for extra comfort and the raised terrace surrounds the villa to make the most of the views. 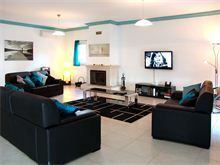 The large open plan sitting room and dining area has three sets of glass doors leading to the pool terrace and has widescreen TV, Playstation 2 with a selection of games and iPod docking station. 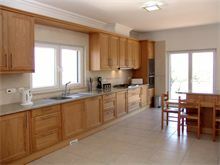 The fully equipped kitchen gives access to the rear terrace and leads down to the barbecue area. There is an additional family room with a 2nd flat screen TV which can be used as a play room, or if required, a bedroom as the sofa converts to a double bed. The resorts of Loule, Boliqueime and Vilamoura are all just a very short drive away making this wonderful country retreat easily accessible to the beaches and resort nightlife. 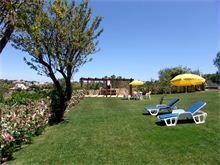 Approximately 4 kms from the shops at Boliqueime and 12 kms from the beach. Sitting/dining room, kitchen with dishwasher and microwave, separate laundry with washing machine and tumble dryer, study with sofa bed and shower room. Upstairs to 2 twin bedrooms, each with en suite shower room, balcony and country views, 2 double bedrooms, each with full en suite bathroom and walk in shower, and balcony overlooking the pool and sea views. 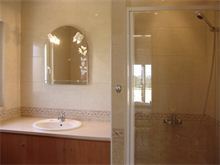 Electric shutters and mosquito net doors throughout. Maid service 2 times per week. 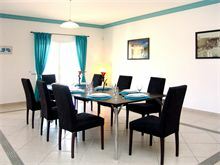 Air conditioning, under floor heating, Wi-Fi and additional bedroom for 9th and 10th person available at extra cost, if required. 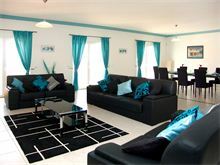 Very spacious and clean, beautiful views and excellent pool area, highly recommended. 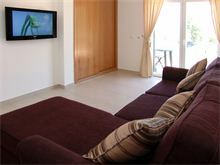 Fantastic villa with excellent facilities. Quiet surroundings with a view of the sea. Only a short drive from the airport and a good base to explore the area. 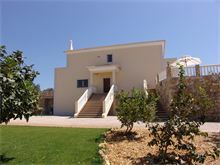 Beautiful villa, very well equipped with a fantastic pool. 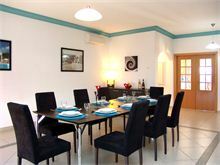 It's located in a quiet spot with only a few other villas nearby, so a car / taxi is needed for most trips to shops & restaurants but it's only a short drive to the nearest towns. Excellent views from its hilltop position, it can get a bit breezy but that can be an advantage when it's very hot. 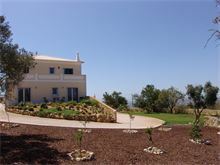 Really lovely villa in an idyllic location. We had such an amazing holiday and spent most of the time in the fabulous pool and really enjoyed our bbqs in the evening with the breathtaking views all around. This is our second year with affinity and we will be booking again for next year. 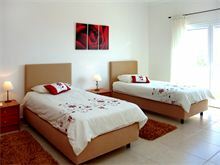 The villa lived up to our expectations and the staff were very helpful to us. The service we received by all the staff were excellent this includes the maids, the pool cleaner was very friendly and helpful, the cleanliness of the villa was amazing, I would recommend this villa to anyone. I enjoyed my 2 week stay wish it could have lasted longer. The villa was gorgeous. Extremely clean. 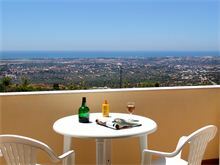 The view from the villa is truly breath taking and you cannot tire from evening BBQ's on the terrace star gazing. A car is essential as it's completely remote. Lovely Villa in a beautiful setting, every window had a fabulous view. A fantastic place away from the crowds. 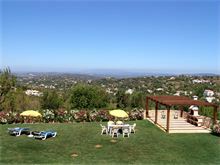 The villa, location and views are perfect. The management were always on hand when required. All in all an amazing place that we would highly recommend. Hope to return soon. 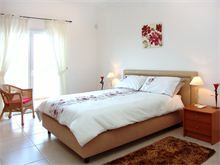 Excellent location, very well equipped and maintained. The Affinity are very helpful and professional.